The radius is the more lateral and slightly shorter of the two forearm bones. It is found on the thumb side of the forearm and rotates to allow the hand to pivot at the wrist. Several muscles of the arm and forearm have origins and insertions on the radius to provide motion to the upper limb. These movements are essential to many everyday tasks such as writing, drawing, and throwing a ball. The radius is located on the lateral side of the forearm between the elbow and the wrist joints. It forms the elbow joint on its proximal end with the humerus of the upper arm and the ulna of the forearm. Although the radius begins as the smaller of the two forearm bones at the elbow, it widens significantly as it extends along the forearm to become much wider than the ulna at the wrist. A short cylinder of smooth bone forms the head of the radius where it meets the capitulum of the humerus and the radial notch of the ulna at the elbow. The head of the radius allows the forearm to flex and pivot at the elbow joint. Just distal to the head, the radius narrows considerably to form the neck of the radius before expanding medially to form the radial tuberosity, a bony process that serves as the insertion of the biceps brachii. Distal to the elbow, the body of the radius continues in a straight line along the lateral side of the forearm before suddenly widening just above the wrist joint. At its wide distal end, the radius terminates in three smooth, concave surfaces that form the wrist joint with the ulna and the carpals of the hand. Two of these concavities meet with the scaphoid and lunate bones of the carpals to form the radiocarpal portion of the wrist joint. On the medial side, the ulnar notch of the radius forms the distal radioulnar joint with the ulna, allowing the radius to rotate around the ulna to supinate and pronate the hand and wrist. 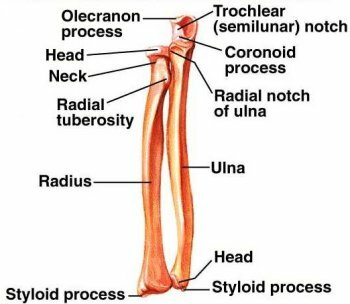 The styloid process – a small, pointy extension of bone – protrudes from the lateral edge of the radius to anchor the radial collateral ligament of the wrist. One of the most important functions of the radius is anchoring the muscles of the upper arm and the forearm. The biceps brachii muscle of the upper arm forms its insertion at the radial tuberosity to flex and supinate the forearm at the elbow. The supinator, pronator teres, and pronator quadratus muscles of the forearm also form insertions on the radius to supinate and pronate the hand and wrist by rotating the distal end of the radius around the ulna. Several muscles that move the hand and digits – including the flexor pollicis longus and flexor digitorum superficialis muscles – also have their origins on the radius. The radius is classified structurally as a long bone because it is much longer than it is wide. Like all long bones, the radius is made of compact bone with a hollow center and spongy bones filling the ends. Compact bone is the hardest and heaviest part of the radius and makes up most of its structure. Many layers of minerals and collagen fibers give the compact bone its strength and flexibility. Deep to the compact bone is a hollow cavity that spans the length of the bone and is filled with adipose-rich yellow bone marrow. Yellow bone marrow stores energy for the body’s cells in the form of triglycerides. At the proximal and distal end of the radius, the compact bone is reinforced by thin columns of spongy bone that give the radius extra strength without significantly adding to its mass. Small hollow spaces in the spongy bone house red bone marrow tissue that produces all of the body’s blood cells. The outer surface of the radius is covered in a thin layer of fibrous connective tissue known as the periosteum, and at its proximal and distal ends is covered in hyaline cartilage. Periosteum contains many collagen fibers that form strong connections between the radius and the tendons and ligaments that connect it to the bones and muscles of the arm. Hyaline cartilage gives the ends of the radius a smooth surface to reduce friction during movements of the forearm. It also acts as a flexible shock absorber to reduce impact stress at the elbow and wrist joints. At birth, the radius begins as a bony shaft, known as the diaphysis, with a cap of hyaline cartilage on both ends. The hyaline cartilage provides extra flexibility to the elbow and wrist joints and provides a medium for the bone to grow into. Around the age of two, the distal hyaline cartilage near the wrist joint begins to turn into a separate bone called the distal epiphysis. A thin layer of cartilage called the epiphyseal plate (or growth plate) separates the diaphysis and epiphysis. The cartilage in the growth plate grows lengthwise to keep the diaphysis and epiphysis separated and to increase the overall length of the radius. At around five years of age, the cartilage on the proximal end of the radius near the elbow ossifies to form the proximal epiphysis. Just like the distal epiphysis, an epiphyseal plate separates the proximal epiphysis from the diaphysis to give the radius room to grow. The epiphyses unite with the diaphysis by the end of puberty to form a single radius bone, at which point it stops growing lengthwise. The region where the diaphysis and epiphyses grow together is called the metaphysis.